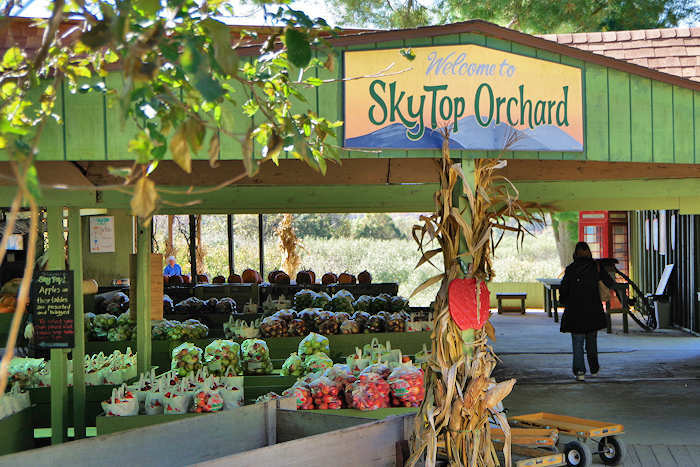 Sky Top Orchard in Flat Rock is much more than an apple orchard. Sitting atop Mt. 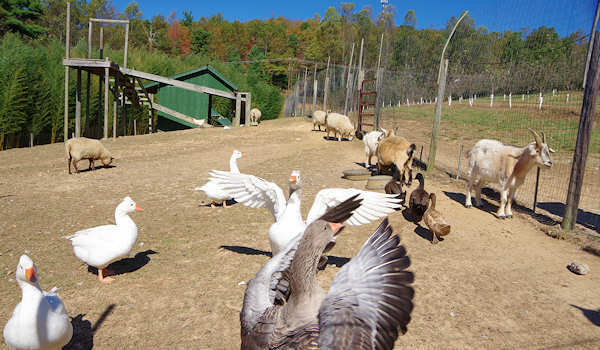 McAlpine with panoramic mountain views, their 100-acre farm is a family fall tradition for many. 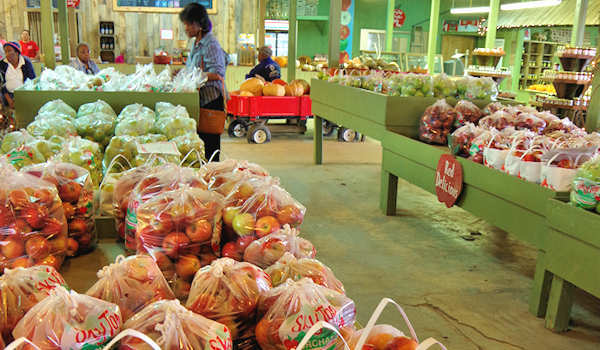 In addition to buying and picking-your-own apples, take a wagon ride, see farm animals, explore the orchards and don't miss their famous freshmade apple cider donuts! Located about 32 miles south of Asheville (and about 7 miles south of downtown Hendersonville), Sky Top is free to visit and open from mid August through November. 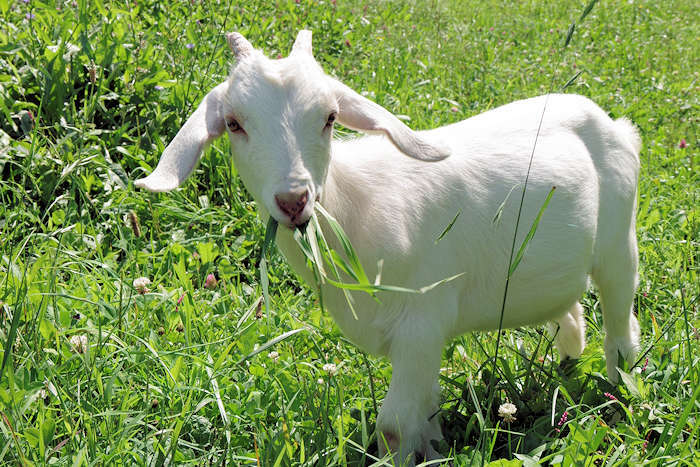 Kids of all ages will love the animals (ducks, sheep, goats, chickens, turkeys, peacocks and more). 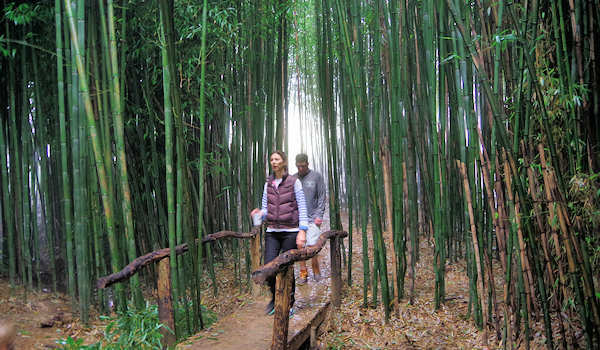 Get lost in the bamboo forest. 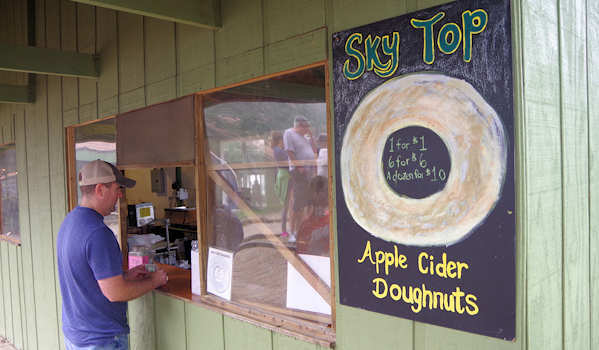 Buy all sorts of apple-made goodies such as cider, apple pies, cider slushies and turnovers. You can also get some hot dogs on Friday-Sunday during lunch hours. Weekends (especially in October) are super busy - and they may run out of parking. Monday-Wednesday are their slowest days. Or arrive near opening time or after 3 PM for fewer visits. Their u-pick season usually runs from August through October. Since they have 22 varieties of apples that ripen at different times, they publish a picking schedule. They are open 7 days a week except for Thanksgiving Day, August 8 through November. Hours are 9 AM-6 PM until Daylight Savings Time ends (Nov. 3). After, they are open 9 AM-5 PM. Directions from Asheville (via I-26E): Go I-26 East to exit 54 (US 25 / Flat Rock). Go 3.2 miles to Exit 5. At the bottom of the exit, turn right. Go 1 1/2 mile to the Sky Top signs. Turn left onto Pinnacle Mountain Rd and proceed up the mountain one mile. GPS Address is 1193 Pinnancle Rd, Flat Rock, NC 28731. Read more about Flat Rock. Saluda is just 9 miles. Find other nearby orchards on US 64 east of Hendersonville.